I made these Skinny Mini Corn Dog Muffins to celebrate the arrival of fall. I love everything about fall. The cooler weather. The foods. The holidays. And especially the fall fairs and festivals and fun food associated with them. 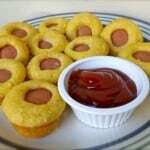 What could be more fun than mini corn dog muffins? I got the idea for these mini corn dog muffins one day while reading, Sara Noel’s Frugal Living Column in the Arizona Republic. 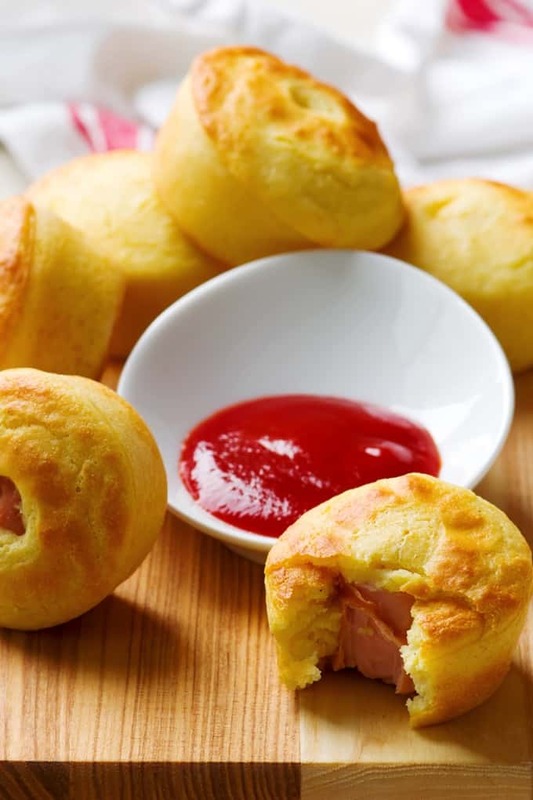 Sara had responded suggesting that you can make cornbread muffins in a mini muffin tin and add a cut-up piece of hot dog in each compartment to make mini corn dogs. And if the kids are really missing them, add a stick after baking. Who knew? A creative, healthy, thrifty alternative to corn dogs. Baked Mini Corn Dog Muffins! 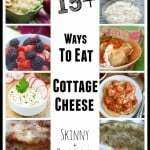 What a great way for those of us who want to indulge our taste buds and fit into our skinny jeans to have it all. 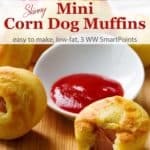 I immediately set my mind on making a batch of these baked skinny mini corn dog muffins as soon as I gathered the ingredients: 97% fat free Hebrew National hotdogs and a small package (6 muffin size/6.5 ounces) of corn muffin mix. 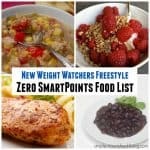 Each one has just 83 calories, *2 Weight Watchers PointsPlus and *3 WW Freestyle SmartPoints. Enjoy! 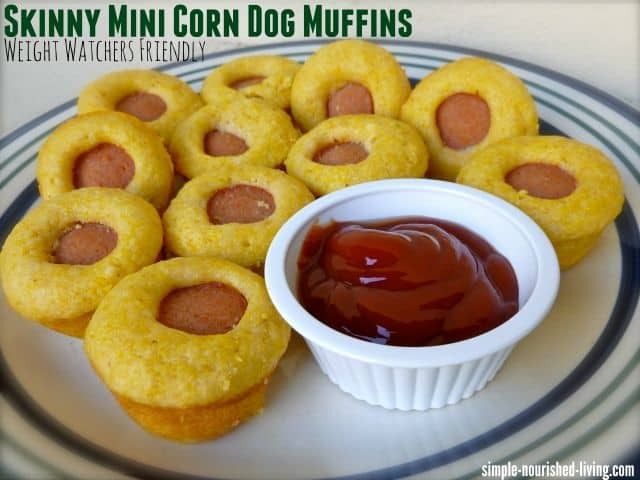 If you’ve made these Mini Corn Dog Muffins, please give the recipe a star rating below and leave a comment letting me know how you liked them. These mini corn dog muffins are an easy, healthy and delicious fun snack your family will love with just 83 calories and *4 Weight Watchers Freestyle SmartPoints! Heat the oven to 400F degrees. Coat mini muffin tins with nonstick cooking spray. In a small bowl, stir together the muffin mix, milk, melted butter, and egg just until moistened. The batter will be lumpy. Scoop the batter evenly into the muffin cups, filling them about 2/3 full. Do you know if these are okay to freeze for later use? I haven’t tried it, but think they should be fine to freeze for later. I just made them and they are great! 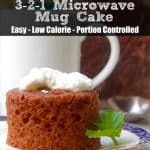 So delicious, and a great idea! Haven’t tried to freeze them yet but we’ll see if there’s and left to be frozen. 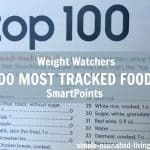 I use the all white turkey hot dogs by ball park that have 40 calories. 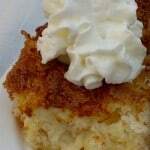 I used egg beaters in place of the egg and added 2 tbsp of unsweetened applesauce in place of the butter. There was no taste of Apple so no worries. 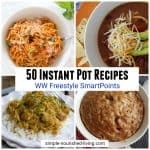 Making these changes through the WW recipe builder made them 3 for 5pp. Hi Tori, Thanks for the suggested changes! LOVE THESE…everyone ate them and had no clue they were a lighter version…thanks for a great recipe~!! 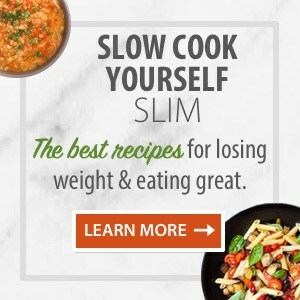 Delicious and easy, right? 🙂 Your photo looks perfect!